C-Line's vast array of shop ticket holders puts everything in perfect working order right at your fingertips-or wherever it needs to be. The strong, rigid and clear vinyl design allows for easy visibility of any type of documents. Each holder has a convenient hole at the top so you can hang information where it makes the most sense for you and your business. The additional hanging strap allows the job tickets to be right with the job itself, providing hands on information and identification when you need it. It features a large 9 x 12" pocket and a small 9 x 6" pocket, ideal for projects and jobs with variety of important information materials. The holder is outlined with reinforced black stitched edge, providing a longer product life. Perfect for a number of uses in manufacturing, auto repair, inventory control or anywhere else records need to be kept closely and protected. Insert Size: 9 x 6", 9 x 12"
We need these in an automotive repair facility. The lower pocket is designed for keys and the bigger pocket for the work order. 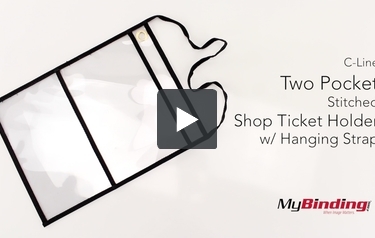 These ticket holders are a must for any shop. They are durable and handy to have your repair orders close by your project. Love the additional pocket for keys or other small items. This is the C-Line Two Pocket Stitched Shop Ticket Holder w/ a Hanging Strap! It easily fits 8.5 x 11 inch pages, even A4 pages. And in the front is room for a half page—but you can really put whatever you want in it. The plastic does like to stick to itself, so it is easier to put thicker pages in instead of normal printer paper. The hanging eyelet is extra large to fit onto even thicker hooks. And the edges are reinforced with this weaved fabric. Of course, it has a strap, which you can hang on just about anything. You can even wear it like a necklace if you want, or use in some more practical way.